Andy Long's five-point pledge to loving his country and being an informed, engaged participant in its democratic institutions. As a former high school history teacher, I often get inspiration from great moments in history — such as the Gettysburg Address, delivered by President Lincoln. The president dedicated a cemetery after the Battle of Gettysburg with over 50,000 casualties; the last part of the address gives me my marching orders in today’s political climate. If I want to honor those who sacrificed to give me the freedom I have today, it is time for me to increase my devotion to our country and our political system. I, like many others, have been sick of what our last couple of national elections were about. It is my fault. It is your fault. We try to let ourselves off the hook by blaming money, political parties and other organizations. But we are still the government of the people, by the people and for the people. We all still have one vote and one voice. To try to improve, I am going to get more involved and become more informed. There are five practices I’m going to follow to improve our government. First, I’m going to become more informed on the issues and listen to different sides of a situation. We are listening to the extremists on “our side” of an issue who don’t bother with education or facts — just sharing emotions and headlines. Our cable news stations are not set up to educate us but to entertain us with sensational reporting to sell advertising. Second, I’m going to engage in civil debate with prepared facts. I will also listen and ask questions about why the other side believes what they do. It is time to stop yelling and start listening and to ask questions to gain understanding. Third, I’m going to verify information before forwarding e-mail or sharing on social media. We read or hear something we like and we immediately forward or share. Most of what my friends are sharing or forwarding is neither completely true nor productive to the conversation. Fourth, I’m going to appreciate you as a person, and not form my opinion of you based on your political beliefs. My default will be to love one another instead of hating those I don’t know or might not understand. Love opens up the world; hate boxes us in. As Martin Luther King Jr. said, “Darkness cannot drive out darkness; only light can do that. Hate cannot drive out hate; only love can do that.” It’s OK to disagree with each other on issues – to move forward, we need to discuss our different political beliefs, whether they revolve around the local swimming pool or international trade. Fifth, I’m going to investigate and promote candidates with character early in the campaign, during the primaries when we choose our candidates. We are fortunate to live where we have people of character representing us, but it is important for us to promote people of character over those who just tell us what we want to hear to get elected. The first is from Joseph Goebbels, Adolf Hitler’s propaganda minister. The second is from James Madison, the father of our Constitution, a Founding Father and our fourth president. It is our duty to bring in a new birth of freedom. We do this by educating ourselves and being actively involved in our politics in a civil manner. 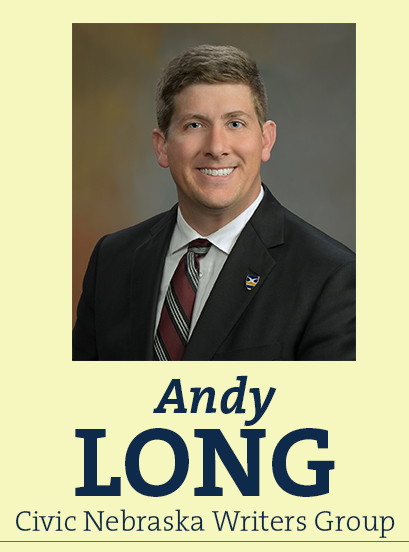 Andy Long is executive director of the McCook Economic Development Corp., and leads community efforts to facilitate the formation, retention, attraction, and expansion of businesses in the McCook area. He also is director of Cultivate Rural Leaders, a nonprofit organization providing rural communities and organizations with leadership education.